UNITED NATIONS, Oct 20, 2011 (IPS) – The U.N. special rapporteur for human rights in Iran defended his new critical report on the country Thursday after it was attacked by Iranian officials, who continue to insist he will not be allowed to visit the country. Ahmad Shaheed told reporters at a press conference at U.N. headquarters in New York that he is sure of the complete accuracy of the contents of his interim report, released last weekend, and will issue a more comprehensive report in the months to come. “One of the important shortcomings of this report and the reason for its being cheap is that this rapporteur has almost [only] presented the claims by the regime’s opponents and enemies, whereas when a special rapporteur sets out to prepare a report, above and beyond any issue, he must maintain his objectivity, and not to hear the claims of one side who has been an opponent of the regime for years and to repeat them, without even the smallest effort to present these claims in a legal context,” Larijani said. He also asked the prosecutor general and Iran’s Parliamentary Human Rights Committee to open a special case on U.S. crimes against Iran and Islamic countries. Iranian authorities have consistently condemned all human rights resolutions adopted by the U.N. as U.S.-sponsored measures to pressure the Islamic Republic. 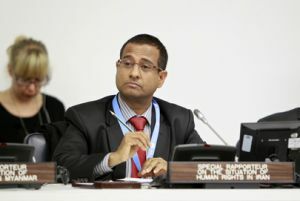 But Saheed, the former foreign minister of the Maldives, told IPS that while he will continue to attempt a dialogue with Iranian authorities, he nevertheless intends to move forward with a more comprehensive report, with or without Iran’s cooperation. “I’m confident the report is reliable and can be useful in producing information about what is happening in Iran,” Shaheed said in response to a question at the press conference Thursday. Since Shaheed’s appointment, Iranian officials have said he will not be permitted to enter the country. But that didn’t stop Shaheed from writing his initial report. “I issued several communications to the Iranian authorities to introduce myself and express my interest in visiting the country,” Shaheed said, reiterating his appeal to Iranian authorities to extend their full cooperation with his mandate as required by the U.N. Human Rights Council. “While I have not been successful in either meeting with Iranian authorities or securing an invitation to the country to date, I am hopeful that the government will consider my requests,” he said. The report included allegations of obstructing free and fair elections, denial of freedom of expression and assembly, allegations of deprivation of the right to education, and the harassment and intimidation of religious and ethnic minorities, human rights defenders, and civil society and religious actors. Shaheed also expressed concern about the Iran’s justice system, including certain practices that amount to torture, cruel, or degrading treatment of detainees; the imposition of the death penalty in the absence of proper judicial safeguards; the denial of reasonable access to legal counsel and adequate medical treatment; and the widespread use of both secret and public executions. He also cited the use of capital punishment for juvenile offenders, and the application of capital punishment in cases that do not meet the level of serious crimes by international standards, such as narcotics cases. Some activists say that the report failed to address other issues such as the crackdown on labour activists, Kurdish dissidents, and those who lost their lives during the post-election unrest in 2009. “A number of families of post-election victims are willing to communicate directly with Mr. Shaheed whether he comes to Iran or not, and they expect their voices to be heard by him as the Iranian government will never hold those who killed protesters in the streets accountable,” a human rights activist in Tehran, who asked that their name be withheld, told IPS. “They risk their lives for doing that and Mr. Shaheed should find a way to communicate with them,” the activist said. In response to a question by IPS regarding the assaults by security forces on peaceful protesters following those polls, Shaheed clarified that his report is an interim report and he had very short time to prepare it. “It was essentially the question of time and space that led to not mention that. I will of course look into this (matter) in my full report. The issue is already there and should be further pressed upon,” he said. He also said that the committee is pursuing a lawsuit against Shaheed by the Iranian judiciary, as the recent report is one-sided and “has been prepared under the management of international Zionism in order to pressure the Islamic Republic of Iran”.